The easiest way to tackle this problem is to break it down into the different types of epoxy products available and explain how they are installed together as systems. You can choose to purchase and install the epoxy yourself or hire a garage floor coating contractor with their own products. Either way, our goal here is to help eliminate the confusion about epoxy and to educate you on the different options available in order to choose the best epoxy for you. There are many reputable brands of epoxy available. What it comes down to when determining the best coating for your garage floor is, what type of epoxy is it and how is it used as part of a system? So please read on to learn what constitutes your basic epoxy products and systems all the way to the best that you can install for your garage floor. Water based epoxy is easy to apply and has a longer pot life that reduces the worry of getting it applied as quickly as other epoxy products require. It’s almost as easy to apply as paint and is why it’s advertised as epoxy paint. Because of this, it is the favorite type that companies like to market to the DIY crowd. Your first choice is the “do it yourself” epoxy paint kits by brands such as RustOleum or Quikrete for example. They can be purchased from your local home improvement center or hardware store for anywhere from $50 to $70 depending on brand and are available in either gray or tan. These kits are designed as a single coat system with roughly 50% solids content of epoxy and a coverage rate of around 250 square feet. They roll on easy and cure to a thin coat of approximately 3 mils with a matte to semi-gloss finish. Though inexpensive, this is the least durable of epoxy to apply. They are based on older formulations and are not the best value for your dollar. Their resistance to stains and chemicals are not as good as other types of garage floor epoxy and they are susceptible to hot tire lift. If you like the easier application requirements of water based epoxy, you can increase the durability and protection with a more professional multi-coat kit that offers a second coat of epoxy clear as a top coat. This also doubles the coating thickness from 3 mils to 6 mils. Some brands such as The Original Color Chips offer kits such as these. They are a better value for the money with more current epoxy formulations and pricing starting around $175. The next step up is the commercial grade epoxy products. They have the best resistance to stains, chemicals, and abrasion. They also have high solids content with the best being 100% solids epoxy. The 100% solids single coat system is much thicker and will cure to approximately 10 mils or more depending on the brand. In fact, a single coat of 100% solids epoxy is more durable than two coats of a typical water based product. High solids epoxy make for a great color base coat to a multi-coat system due to their high build and are available in many choices of color options as well. Cost for these commercial grade products vary depending on the solids content and brand. Expect to pay a minimum of $115 for clear epoxy only that will cover 250 square feet. The price goes up from there for standard colors and custom tints. For an average price of $180, many of these kits include the tools required to apply them plus a bag of colored acrylic paint flakes or chips to apply to the floor as well. Though this type of epoxy is a much better value, it is not as DIY friendly as water based epoxy. It has a much thicker viscosity and needs to be back rolled when applied. The pot life is shorter as well, requiring that it be applied to the garage floor within 30 – 40 minutes after mixing. To improve upon the single coat 100% solids epoxy, the next step is to add a coat or two of clear epoxy or polyurethane. This is referred to as the top coat. This clear coat system adds not only durability and thickness, but is also what gives your floor that deep gloss and shine. If adding a topcoat, you also have the option of adding additional paint chips to your base coat. They can be sprinkled on sparingly or they can be applied to full refusal. Full refusal is the process of throwing on chips until they don’t stick anymore. There are two reasons you may want to do a full refusal broadcast. The first is that it will give the floor some texture, increase thickness for durability, and help to produce an anti-slip surface. The second reason is pure cosmetics. With the multitude of different colored chip combinations to choose from, you can give your garage floor any custom look that you like. The best coating that you can apply to your garage floor will be a premium multi-coat epoxy system. This will consist of a primer coat, 100% solids basecoat, acrylic colored paint chips if you desire, and one or two topcoats of clear epoxy or polyurethane. It’s not uncommon for such a floor to be between 30 and 40 mils in thickness. These type of floor systems can last 15-20 years or more. Any premium epoxy system will involve a primer. Most primers will be anywhere from 50% to 70% solids content which will make for a thinner coat and consistency. There are many reasons for using a primer. The thinner consistency allows for the epoxy to seep deeper into the pores of the concrete to create a better bond. It also creates better adhesion for your basecoat and helps to prevent pinholes and bubbles which are caused from out gassing of the concrete. Though this epoxy system is the most expensive of garage flooring options, this floor coating will give you the best return for your dollar. Cost varies depending on the size of your garage. Expect a minimum cost of $850 in materials for an epoxy primer, color base coat, acrylic color flakes, and clear top coat for an average sized 2-car garage if installing it yourself. Garage flooring contractors start around $4.50 a square foot for a similar system and go up in price from there. If you are going to apply an epoxy coating yourself you can create any one of the above combinations. Just remember when looking at different brands, compare both the coverage rate and solids content along with the price. If product A covers 250 square feet per container and product B covers 300 square feet per container, you are much better off going with product B if you have a 540 square foot garage. Do not attempt to stretch it out or you are destined to receive poor results. Another factor to consider is the supplies that come with these kits. Some brands include rollers, mixing paddles, spiked shoes, paint brushes and other supplies in their price. Lastly is checking to see if they offer technical support. If this is your first time at applying a good quality epoxy and you want to make sure all your questions are answered, a manufacturer with good customer service is worth every penny. If you are looking into hiring a contractor to install an epoxy coating for your garage floor, make sure to ask how many coats they use and what each coat does. Many times flooring contractors will substitute lessor quality epoxy or less coats in order to compete in price. So remember when choosing the best epoxy coating for your garage floor and budget is to make sure you have enough to cover your floor. Multiple coats will increase the wear and durability of the floor and always go with a higher solids content if you can afford it. The dollar cost average over time for the floor is much better if you do. And finally, if applying the floor coating yourself, choose an epoxy manufacturer with good customer service to insure a good experience and a quality floor. I live near Houston Tx. I am wanting to do my kitchen aand bathroom floors with decoative epoxy like Leggari epoxys shows on their web site. Also i want to do the counters. Is there any reason I cant use the floor epoxy on the conter tops? Hello David. We would recommend contacting them about the counter tops. Counter top epoxy is generally formulated differently. They seem to be a new company and haven’t completed its website yet. We could not find any info on the product either. Hello…I have used the standard Rust-oleum garage floor product and was just ok with the results. Since then we moved to Naples Fl. where the heat gets the car tires very hot. Given that this has to be DIY project, I want a product that I can apply. I have a two car garage and one paint store recommended a product called Rokrez Pro (SP?) I know all the things I have to do to prepare the surface i.e. acid surface prep. and the precautions necessary, rollers spike shoes. gloves sprayer etc. etc. So what product do you recommend for an epoxy paint product, based on your experience and people who have tried other products pros and cons! Hi Bob. For your garage we would highly recommend that you consider a single -part polyurea garage floor coating. These are excellent DIY kits. One of the vendors we list in the article is Legacy Industrial. They are located in Florida as well. They were one of the first to introduce single-part polyurea as a DIY kit for the exact concerns you state. Hot tire lift is not a problem. RokRez Pro is a 100% solids epoxy. 100% solids epoxy is excellent for a garage floor, however, it should not be applied to concrete without using an epoxy primer first. Some manufacturers (RokRez included) state that their 100% solids epoxy is self-priming – there is no such thing. It’s a marketing gimmick to keep a customer’s cost down when comparing against competitors. The viscosity of 100% solids epoxy is fairly consistent. It is thick, you have a limited pot life to work with, and it does not penetrate as well into the pores of the concrete in order to get a good mechanical bond. This article here explains why an epoxy primer should be used when using 100% solids epoxy. Be sure to use a the appropriate epoxy primer if you want to use RokRez Pro. Also, make sure to use a high performance clear coat as well. Hello Kaiser. This article here discusses how to repair or reduce low spots in your garage floor. After you address that fix you can then seal your garage floor. This article here discusses your options. I’m looking to apply a coating on my 3 car garage. I live in Michigan – snow ,salt, range of temperatures. I’m not concerned with price as much as finding the best product. I have always thought 2 part epoxy system. I found a manufacturer of a 2 part in the Detroit area. I will apply myself with help from technical support and experienced applier. Can you suggest a product? Hello Tim. We would recommend contacting EpoxyMaster. They sell excellent, commercial quality floor coatings and are located just north of Detroit in Troy, Michigan. Hello Jon. It sounds like you have a solid plan in terms of prep and wanting a good product. For a thick build coating, you need to first apply an epoxy primer and then a high solids to 100% solids epoxy color coat. If it’s in the budget, we would recommend a clear coat of polyurethane or polyurea as a top coat. High solids epoxy is extremely hard and as a result it scratches easier. The polyurethane or polyurea clear coat is much more abrasion resistant as well as chemical resistant. There is no need to power wash if you are grinding. Just vacuum the surface real well with a shop vac after you are done and you will be good to go. Introducing water will mean having to wait a minimum of 24 to 48 hours for all the water within the concrete to evaporate and dry out. It may take longer than that since you live in Eugene. Chances are very slim that you find a brick and mortar store with what you need. Most commercial quality concrete coating products are found from vendors online that specialize in concrete coating products. Our sponsors on the right side bar of our side is a good example. Legacy Industrial, Garage Flooring LLC, ArmorPoxy, EpoxyMaster, and GarageCoatings.com are examples. Give them a call and tell them about your project and they would be more than happy to help choose the correct product for what you need. Have you heard of a company called Epoxytech? They have some good process but I’m a little skeptical, but they make some great claims on their website. Any info would be greatly appreciated. Thanks I’m advance. Hi Derrick. All we can tell you about EpoxyTech is that they have been the subject of many conversations within the industry about their advertising practices. They may or may not have good product, but we cannot verify that for you. I am looking to seal the concrete slab that will be supporting my shed. I am looking for a long lasting and durable expoxy that I can DIY. Is it possible for me to apply before the shed is dropped in order to cover 100% of the slab? My concern is that it will be exposed to the elements for a few days. Hello Chad. Epoxy will amber (turn yellow tint) fairly quickly if exposed outdoors to direct sunlight. You would be better off doing all the concrete prep work for the epoxy first, install the shed, then apply the epoxy. As long as the concrete stays clean while the shed is going on you will be fine. Make sure to use an epoxy primer when using a high solids or 100% solids epoxy as well. Many of our supporting sponsors carry excellent product. As long as you are purchasing from a concrete floor coating vendor you will be getting good quality product. I will be doing the multi step process of primer, epoxy, and top coat. I am in Omaha, NE and wondering where to get product from. I saw your sponsors are listed but who would have the best product for the best price I have close to 900sq foot for a 4 stall garage. Hello Kaitlynn. That’s a nice size garage! All of our sponsors have excellent product and they ship for free. We suggest contacting a few and talk to them about their current specials. Pricing is always changing and we are not privy to who is having sales and who isn’t. Also, you will learn a lot when speaking to them about your project. These vendors want you to have a successful floor coating and will offer tips and advice about how to achieve this. Shea, I live in St. Louis and the quotes I’m getting are more like $7 a foot. I am very handy but was hoping to pay someone to do this. That said, what should I estimate in man-hours for a typical 2 car garage, presuming I did the multi-coat system you describe above? Excluding special prep like crack and spalling repair, but including normal prep. Hello Jeff. It sounds like you may have been getting quotes for the 1 day polyaspartic polyurea garage floor coatings. To do it on your own the first time, you can factor in aproximately 8-12 man hours depending on if you grind or acid etch (grinding takes more time). This doesn’t include the time you need to wait between coats or any special prep for repairs and such. You are correct. They were both pitching the Polyurea as much better than straight epoxy. Thank you for the estimate. That is VERY reasonable. Given my ‘deliberateness’ (as my boss used to call it), I will presume it will take be twice as long. The other option I am considering is porcelain tile. Would you care to take a crack at the time estimate on that? It seems to me it would take quite a bit longer. I’ve applied tile to walls, but never to a floor. Yes, a porcelain tile garage floor can take much longer and there are many factors involved that can determine how long it will take someone. Tile size is one factor, grout is another, how OCD you may be about edges lining up flat with each other (one of my problems), as well as the experience of the person laying the tile. If you have the time it can be a rewarding experience and you will have an extremely durable garage floor that will last many, many years. 24 to 40 hours is a good estimate for someone with a little bit of tile experience. The first initial tiles take the longest, but there is a swift learning curve and most people get much faster as they go along. Thanks! That seems reasonable. I hear you on the alignment thing – side to side, front to back, AND elevation. Especially a lot of fun for ‘artisan’ tiles that are not all the same dimension. Hello Mark. We would recommend two coats of the newer single-part polyurea coatings. These are great quality coatings and easier to apply than traditional epoxy. Two coats will give you close to 10 mils and it will be more scratch and wear resistant. If you want something even more durable, then the multi-coat epoxy system consisting of a primer, base coat, and clear coat would be the way to go. Thank you for the response. After further research and your response I’ve narrowed it down to garage flooring’s Polyurea kit (2 coats), or Roll on Rock epoxy kit (4195/5073). Based on research the epoxy has limited setup time, wasted excess due to needing to mix more than needed, and potential to fade, so isn’t the Polyurea kit a no brainer? Hi Mark. I’m not sure what you mean by wasted excess when it comes to the Roll On Rock 4195 epoxy unless you have a space where square footage slightly exceeds what a kit covers. There are some trade offs between the two systems. The single-part polyurea kits can be applied in a single day due to the faster curing times which is nice. However, the 4195 epoxy is thicker than polyurea and makes for a higher build coat. You are correct that epoxy can amber (get a yellow tint), however, the Roll On Rock kit is designed for full color flake coverage. Color flakes are U.V. stable and they cover the epoxy completely. Also the 5073 is U.V. stable since it’s a polyurea. As a result, both of the systems you are looking at will not amber. What do you recommend for a brand new garage floor, something high quality that I can apply myself. something with low VOC, not too bad for odors. 20feet by 20 foot garage . Some brands names would be good and how to purchase them. Thank you. Hello Robert. There are actually many high quality products that you can choose from. Our sponsors on the right side of our website are a good place to start. Roll On Rock is one such system that has garnered high praise. I live in upper Indiana. I have a one year old floor that has never been sealed. I have been told that this is a perfect time for epoxy. Do I have to grind the floor or can I just power wash. We really have not used the floor yet.Also. I want the best epoxy.. So what do you recommend. This site is very helpful. Hello Tim. Yes, you do need to profile the concrete correctly when applying a good epoxy system. Power washing will not do that. The proper profile is achieved by grinding or acid etching. A good system is going to consist of an epoxy primer, high solids epoxy base color coat, optional color flakes, and a coat or two of a high performance clear polyurea or polyurethane. Full color flakes floors provide the most protection since the flakes add another 5-6 mils of thickness. If doing a full flake floor, you typically need 2 coats for a clear polyurea or 3 coats of a clear polyurethane. There are many places to purchase great epoxy products, but your local home improvement centers is not one of them. We suggest starting with someone like ArmorPoxy, Legacy Industrial, Garage Flooring LLC, or EpoxyMaster. These companies all offer excellent product with good customer service. We suggest giving any of them a call and tell them about your project. so if i used a acid i would not have to grind? Yes, Tim. In most cases you can get by with acid etching instead of grinding. This article here explains the differences. Hey there, I live in Toronto, Canada. I was wondering if you could recommend a product? Also when applying polyurethane clear coat, should I opt for water based or oil based? As I have been told oil base clear coat can discolour. Thankyou. Hi Harvey. We are not familiar with the concrete coating vendors in Canada. There are vendors in the U.S. that ship to Canada, but I’m not sure if that would be feasible for you or not. EpoxyMaster is one such vendor that has excellent product and ships to Canada. Regarding polyurethane, do not get polyurethane for wood floors confused with polyurethane for concrete coatings. Polyurethane for wood and furniture is not compatible with concrete coatings and would need to be removed if applied. Also, polyurethane coatings for concrete are primarily solvent based, never oil based. There are some water based polyurethanes available for concrete coatings, but they are not as durable as their solvent counterparts. I have a 40 ‘ by 24’ 1 year old cement work room that is smooth and has no stains, do I need to acid etch it? I have used a 2 part epoxy from Sherwin paint, is that any good? I am in Michigan. Hello Mike. If you use the Sherwin Williams product you will need to acid etch it. How do you plan on using the room? I am putting in small machines , lathes and small vertical using coolant and other liquids. What products would you recommend. OK Mike. If that is what you are using the area for, we would suggest a coating that has high chemical resistance and good wear. There is a new high solids epoxy that has been introduced by All Weather Floors that has excellent chemical resistance and does not need to have the floor acid etched if it passes a water test. We would suggest this along with the glass beads in the final coat to increase wear, grip, and abrasion resistance. You can read about it here. I will contact the company this week. This is the last thing on my to do list. Do you recommend adding the flakes and a top coat? That’s up to you, Mike. It will increase the cost, but it will also create a more decorative look with a deeper gloss if you do. I have a 2 car garage and the cement floor is is pitted from salt. What would be best to do ? Hi Tom. Can you elaborate a little bit? What is your ultimate goal? Do you just want to stop the pitting or do you want to repair it as well or something more? I live in Calgary Alberta, Canada. Read many articles here about the different products and options in regards to concrete garage floors. I have a brand new about 2 month old concrete garage floor in my 2 car garage and a driveway. Not sure which product to use and which route to go as epoxy seems like the best option since the polyurethane seems to be sold in the US and not amazon or locally. Want to do it right once and have it last 5-10 years against the salt, snow, gravel/sand and be oil resistant and all that good stuff. What do you recommend? Can it be used on the driveway where it’ll see constant rain, sun, snow, shoveling, harsh climate? Hello Tahir. We searched through Amazon.ca and didn’t find any products suitable for your use. Stay away from the Rust-Oleum and RockSolid garage floor kits as they will not stand up well to your winters. Epoxy-Coat has a Canadian distributor which you can find here. It’s a 100% solids epoxy that will work well. Also, EpoxyMaster ships to Canada and would be a good vendor to contact. You do not want to use any type of coating on your driveway. It will turn extremely slick when it gets wet, let alone if snow contacts it. For exterior concrete we recommend using a penetrating sealer similar to this one. Penetrating sealers are none film forming and will retain the same grip as bare concrete. I’m getting ready to paint a shop floor. Shop is 60×36. In the past I’ve used the Rustoleum 2 part kits from Home Depot. In one garage had great luck with it. In my last bigger shop I made the mistake of listening to HD and used a Behr product that was Junk. So I cleaned that up and put rustoleum over top. It’s coming up in places but it’s probably more to do with the junk under it I couldn’t get 100% up. Anyway, in this shop, I’ll have my bobcat and some other things and with over 2400 sq ft, I’d rather try and find something I can spray with an air less sprayer. WIth that said, I’m not going to break the bank, it is just a shop and the reason for painting is to just keep oil and grease from staining the concrete and becoming an eye sore. I’m going to check with Epoxy Master and I’ve seen some commercial 5 gallon packages advertised. What would be your recommendation. If I could get the Rustoleum to work like I did in my first 2 car garage, it worked decent. However, I’m putting a little heavier equipment on this one so looking for a little upgrade. Recommendations? Hello Chris. The first thing we recommend is grinding the floor to bare concrete to get rid of the inferior product. This will properly prep the concrete at the same time for a new coating. There are few coatings that can be sprayed onto concrete. Polyaspartic coatings can be sprayed, but they are expensive and don’t provide as smooth a surface. Pool linings and truck bed liners are an example. Rust Bullet can sprayed, but it will require at least three coats. Our recommendation would be two coats of a single-part polyurea coating. I am getting ready to repaint my garage floor. It currently has paint on it which was applied 10 years ago. It has never pealed and still is holding up okay. It is not epoxy. I want to use epoxy this time. What do I have to do to prepare the existing painted floor? Hi Bill. Are you positive it’s paint and not an epoxy coating or something similar? In our experience we have rarely seen paint go that long without wearing out or peeling up. How does it react if you pour some MEK or acetone on it and then rub it good with a rag? If color comes up on your rag or the surface gets soft, then it’s paint. The general rule is that you never want to apply a true coating, epoxy or otherwise, to paint. The reason is that coatings adhere much better than paint does. If you apply a coating to paint, then it only stays adhered as well as the paint and you don’t get the performance advantage of an epoxy. If it’s paint you want to remove it via grinding. If it’s a true coating, then you can rough up the surface with 120 grit sandpaper, vacuum up the dust, then wipe it down with denatured alcohol on a lint free towel. After that you can apply your coating of choice. Hi. i have a laundromat floor with paint chips(are they called flakes too?) that i want to do for my family. What products would you recommend me to use and i’ll take any ideas from you guys as well. Hi Leopold. Yes, they are called color flakes or paint chips. For a family laundry room we would recommend one of two products. The first is this simple, but high solids epoxy. You can read about it here. One of the advantages to it is that you may not have to etch the concrete if your floor is porous enough. For something a bit more glossy looking and even more durable, the single-part polyurea coatings are excellent as well. They do require that you etch the concrete at a minimum, however. It’s a commercial laundromat. I forgot to mention that. Want it to have sone anti-slippery properties as well, so i figured the garage coating might be best. Hi Leopold. Many times commercial grade garage floor coatings and indoor coatings are one and the same. For a commercial use laundry mat you will want to use premium products in order to avoid having to do the job again a year or two later. A system that consists of an epoxy primer, 93%-100% solids epoxy, color flakes to full refusal, and a couple coats of a clear polyurethane or polyurea will stand up very well. You will want to add an anti-slip additive to the final coat. We suggest contacting ArmorPoxy or Legacy Industrial for such a system and to tell them about your project. They supply product to commercial installers and are very familiar with what will be needed for such a project. I live in NY (just North of Manhatten). I was told from a garage company that I should do floor tiles instead of epoxy bc of the weather where I am. He said the epoxy will start to crack and give me issues? Is any of this true…or is he just trying to upsell? And if Epoxy is okay in my area, how do I find a reputable installer who I know will use a quality product and take all of the necessary steps? Hello Alex. What the garage company told you was not true. The only reason a properly prepared and installed coating would crack is if the concrete cracks. If you have issues with your concrete slab and it’s creating new cracks, then a floor coating would not be the best choice. Old concrete cracks are not a problem, however, and can be properly repaired. It’s a standard part of the floor coating process. A quality commercial coating will stand up well to the weather in your area. We have an article here about how to choose a floor coating contractor. Also, you can give ArmorPoxy a call and ask for references in your area. They are in New Jersey and supply commercial concrete coatings to a variety of installers in the North East. They also have their own installation division. I have an indoor room app 38x18ft. I etched (HCl) then applied Behr masonary primer ( not water based), and finished with Behr 1part epoxy paint(water based. I had planned on using the Behr “wet look” a styrene based(?) water cleanup product. Hello Daryl. 1-part epoxy paint is an acrylic latex paint that has been fortified with a small amount of epoxy resin to help make it more durable. It is not an actual epoxy coating, however. This article here explains the difference. Because it is a water based acrylic paint, the only appropriate product that can be applied over it is a clear water based acrylic sealer such as the Behr Wet Look. Technically, a water based clear epoxy could be applied, but it would require that you first sand the surface with 120 grit sandpaper in order to create a mechanical bond for the epoxy to adhere to. 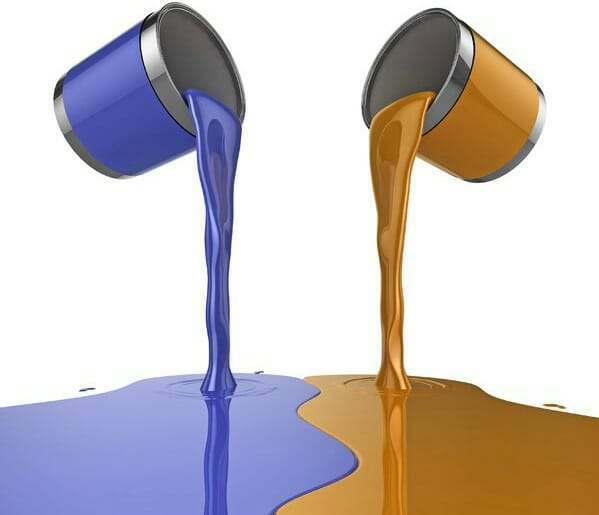 Most polyurethanes cannot be used since they are solvent based and will soften the paint and cause it to bleed during the application process. This article here explains more about clear coats. Yes, a water-based clear coating such as an epoxy (as we mention in the article we linked to) or the newer polyurethanes will work. Keep in mind, it will require roughing up the paint with 120 grit sandpaper before application since these type of coatings are not chemically compatible and require that the paint be fully dry before application. You are going to loose quite a few of your color flakes when you do this since they do not embed well in the thin paint. We don’t even mention the water-based polyurethanes for two reasons. The first is that they are expensive relative to the paint. Second, is that while it will vastly improve the scratch resistance, and chemical resistance of the floor, it will not improve the paints resistance to peeling or hot tire pickup. The paint is what is adhered to the concrete and not the polyurethane. As a result, you can still get areas where the paint will peel up from the car tires. However, to answer your question as to where it can be purchased, you can find it here from Legacy Industrial. Their pricing is right in line for a quality water-based polyurethane coating. Lastly, do not confuse polyurethane coatings from home improvement centers with concrete coatings. The ones at home improvement centers are for wood floors and furniture. They have a yellow tint and will not work. I’m looking for a coating epoxy for my garage floor, it 30’x 40’. The garage is new, no grease or car has parked in it. I’ll be using the normal items on the epoxy, floor jacks and car lift. I live in Goodyear az, planning on doing this in February 2019. Any suggestions on epoxy type. Hi Mike. Yes, we recommend using a high solids (greater than 90%) to 100% solids epoxy preceded by a coat of epoxy primer. Many of our sponsors on the right side of our site carry such product individually or in kit form. This type of system is designed to last 10 years or more depending on how you use it. Jacks, jack stands, automotive repair and etc are not a problem with this type of epoxy system. Hello Libby. EpoxyShield has a high gloss epoxy clear that you can apply. You can see it here. Rust-Oleum has a 48-76 hour recoat window. After that, you will need to degloss and rough up the surface of your current coating with 120 grit sandpaper before applying a clear. Most home improvement centers don’t carry the clear. If you can’t find it locally, you can order it here from Amazon. Can I use something other than Rustoleum product? Yes you can, Libby. It will still require the same prep process before application.